It had been many months since I had been fallen at the Ramenshop in Kansai. There is much I could say about the events that followed, but that is a story for another day. On this day, I just wanted to come and see this place I had loved. Nonetheless, the memories of my confrontation with the yakuza instilled in me a sense of deep insecurity. And those many, mixed feelings were with me as I crossed the bridge to Kansai. It was Autumn, it was cold and I was very unsure of myself. I stood outside the Hanami Fan Shop owned by my former Onesan, Masumi san. The city looked so familiar and at peace to me. I went over to the docks near the home I knew in those early days of discovery. The brightness of the day fell upon the beauty I had fallen in love with a lifetime ago. 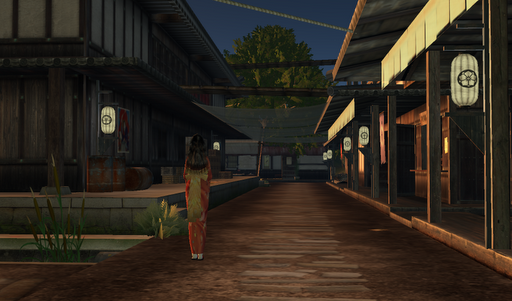 I spent many hours walking through the streets of the town. I visited the Nakanoshima Okiya but couldn’t find any of my old friends. I had heard about the new okiya, Arashiyama Okiya, on the other side of town and visited there too. I visited the docks where I filled my lungs with the breezes from the sea, and I even climbed the hill to the dojo to see a lovely view of the city. I found the city to be at peace. I found no signs of the yakuza that had cast such a dark cloud over the city. As I walked through the town, I made my way to the street leading to the Ramenshop. Standing there, the town turned dark and my blood ran cold. I hurried away from town center, back across the bridge to the great market of Hosoi. There I waited for my ride back to my home. As I left I looked back on the path leading to Kansai and I wondered what the future would hold for me. The days following my injury at the Ramenshop were only known to my dear sister, Koniki. And the days of my recovery were tainted by great pain and loss. This visit to Kansai left me with the determination to fully record the story of what happened into my personal journal. by Yordie, former geisha and former wife of a great samurai. 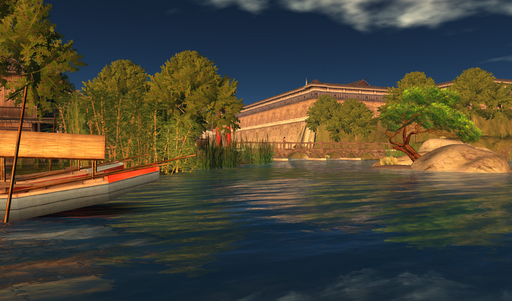 This entry was posted in Journal and tagged Geisha & Samurai, Role Play, Second Life, Stories, Writing. Bookmark the permalink.